This year like every other year of my life.... I took a lil trip down South to Birmingham, Alabama. Always a good trip for me. It feels like a mental cleansing from the daily rush of living in L.A. I get to spend time with family and visit old places, really relax and take a break. This year was unexpectedly extra special for me. This year I had the pleasure of taking mini me along for the ride. I've always taken my daughter whenever we visit Birmingham, but this year is a very pivotal year for her mental development. She's asking more questions an taking in more information than ever before. She's really shaping into a perfect little person, with an amazing personality. 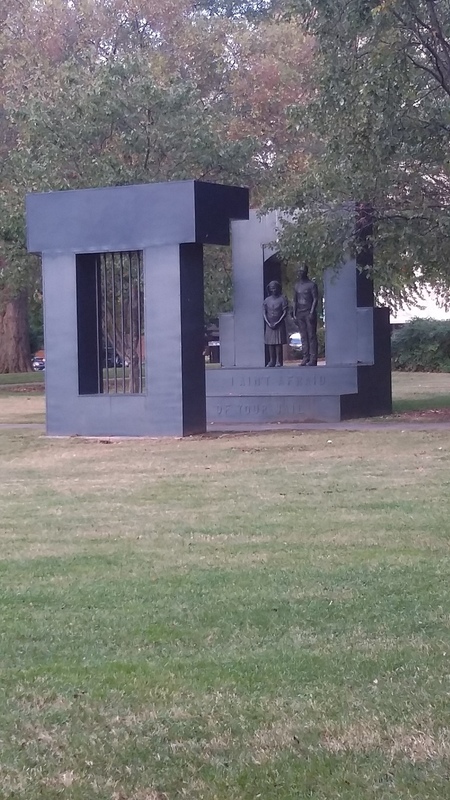 I took my munchkin to the only place I knew would make an impact and a solid memory for her trip to Birmingham, the 16th Street Baptist Church and Kelly Ingram Park. And she loved every minute of it. She was a little afraid of the sculptures at first but it didn't take long for her to loosen up and get used to the environment. Her favorite was the "Four Spirits" Sculpture. Here she is pretending to be a part of the art. The next thing that happened almost made me cry... She kneels down to the bench and starts to run her fingers against the pictures really slow and she turns to me and says "What happen to them?" I said to her " They're with the angles now..." And she gives me this look as if to say " I know that stupid" and then she says, in the most aggravated tone ever, " I know that, but how ... what happened to them?" I have never seen her so focused! I couldn't bring myself to tell her. She isn't old enough and I wasn't ready for all the questions that were to follow... So I told her I'd tell her later... She didn't ask anymore questions about the sculpture. She just continued to stare at the photos as if the girls were talking to her. When she was done she took a long deep breath and skipped to the next statue. She didn't say too much after the "4 Spirits" sculpture. She just kind of ran around as I snapped pictures. I think she really enjoyed herself. She danced around like she was chasing butterflies and stopped to look at all the statues and touch the words. There were two particular displays my baby wanted no parts of. And I understand why.... They're scary and its crazy to think about what they stand for. After she saw these last two sculptures she was ready to go home. We wandered around this very small park for almost 2 hours. My intentions were to place her in the middle of history.... So that when she sees these pictures later in life, hopefully she will be compelled to ask about her history. Hopefully, she will want to dig deeper into more than just what is taught at her school. I hope she takes advantage of her connection to Birmingham and prepares and learns all she can. My favorite human beings were born and raised here...lived and died here.... My only regret is not having the presence of mind as a small child to ask of their experiences and to share the pictures they have... and to ask for the "tour". We drove around the city a little more after this. As we were making our way toward the Vulcan, I pulled over to show her where we were going next... and she quickly declined...lol! Maybe when she gets a little older...she was so afraid even though we were a few miles away. On the drive home, I noticed so many empty buildings for sale, so many beautiful homes left to rot. I had already built a good little list of real estate I wanted to check out while I was there, mainly because it is unbelievably affordable to acquire a few income properties. Birmingham is a real estate moguls playground!! My dream for this coming year is to make enough to buy quite a few properties, remodel them, rent them out, so that mom can retire and move back home and stay out all night with my cousins! HA! I love to see them together. I would love to start a project to beautify the neighborhood where my mother grew up. I absolutely love this city. It hurts to leave... but when I come back it feels like I never left. The people are friendly... the gas is far more affordable than it is in L.A. I just love it here. ***GIVEAWAY*** A $25 Amazon Gift card to the first person who can tell me why Birmingham is called "Magic City". Subscribe to my blog or follow me on Instagram, Twitter and Facebook @onebadbreeze and answer in the comments section below. There's more great pic on my Instagram page! I promote positivity ....sharing is caring! P.S. Check out the SHOP MY LIFE section for some Alabama A&M Gear ROLL TIDE!! !